This Sunday we explored the vast and glorious mystery of the Trinity. Pastor Chris did a brilliant job of unpacking this mysterious truth for us and showing us powerful evidence of the Trinity in Scripture. You can find the sermon here and the notes here. The importance of this aspect of God’s nature cannot be overstated. Though it can be a daunting thing to dive into, since the reality of the Trinity seems to remain a bit beyond our mental capacity to fully comprehend it, I actually find it comforting to know I serve a God more wonderful and complex and relational than I can wrap my mind around. It gives me a great deal of security, like being under the protective care of someone stronger and more equipped than I am. I am glad this fellowship of oneness suggests dimensions and realities beyond what I can fathom. I seem to have an endless hunger for connection and relationship and I can breathe a little easier knowing that truly rich, unbroken, endless relationship exists and more than that, I am invited into that fellowship. The more I meditate on this truth, the more staggering I find it. Consider the image of a feast. Imagine coming together at a beautifully set table, linen cloths, vibrant food in elegant bowls, greenery surrounds, lights are strung overhead, the fellowship gathers, the wine is poured, the conversation is real, the laughter genuine, the togetherness seeming to push pause on time and space and nothing but this moment matters. Or perhaps you are more like the men in my life and your ideal fellowship gathering does not involve linen tablecloths, but looks something a little more like a viking feast, meat and ale and bold stories of daring conquest. Either way, we all long for such feasting moments. 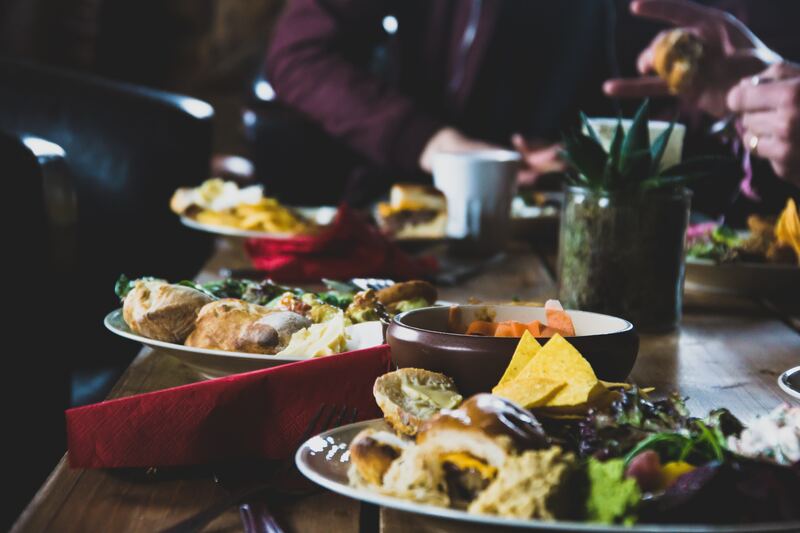 Feasting is one of the rich gifts of life and there is something about it that has the capacity to be profoundly bonding, but so often our attempts to share such a moment get broken and tense and stressful. But every once in a while, it happens, that glimpse into Heaven when the feast is good and the fellowship strong. We long for beauty and satisfaction, for unity and fulfillment—we can find that in the community of the Trinity. Think of all that has gone into preparing for the feast that is coming. I think of creation, the dawn of the earth. God was there, Father, Spirit, and Son, building and shaping and breathing life into existence together. I think of the years that have followed that dawn, the work God has done since—the Father’s involvement, his provision, his discipline, his promises, his guidance; the Son’s miracles, his love, his sacrifice, his resurrection; the Spirit’s empowerment, enlightenment, comfort, help. What is it all leading up to? What is all of it accomplishing? We look to the end and we find a feast—A wedding feast. It is the wedding feast of the Lamb (Revelation 19). This image is eternity set in my heart. I long for that wedding feast. I ache for it and relish every glimpse I get of it now to expand my hope for the fellowship that is coming. I dream of this feast, and it is not just an idea. I am actually called into it, invited into this oneness with the Trinity. This is where we will find complete unity. The fulfillment and satisfaction we long for can be found in union with God, it is there, within the very real fellowship of the Trinity. It is not just an idea, it is where I belong, enfolded within, reminding distinct in role and purpose, becoming whole. So take note of the feasts within Scripture, the mention of bread and wine, the indication that God too is longing for a day of great “joy and gladness” when the fellowship will be wholly united. Hints of this feast are woven throughout the entire Bible as well as the fabric of our reality. Remember the promise of the wedding feast that is coming next time you go to a wedding reception or a family reunion or sit down for Christmas dinner. Though not perfect now, take note of when these moments become a refraction of a the fuller reality they echo and set your sight on union with God.